Is the UK Department of Digital, Culture, Media and Sport the real life DOSAC? Under-qualified Ministers, photo-ops with minimal media presence and a mash-up of policy areas which don’t really align, it’s like the UK government is taking advice from the writers of “The Thick of It”, reports Telecoms.com (FinTech Futures’ sister publication). For those who haven’t seen the show, “The Thick of It” is a BBC series which satirises the inner workings of modern British government. There are calamities, botched policies, a lack of funding and Ministers who seem to be making it up as they go along. The series focuses around the fictitious Department of Social Affairs and Citizenship (DOSAC), and could easily be likened to the real-life Department of Digital, Culture, Media and Sport (DCMS). The most obvious similarity is the departments themselves. Both DCMS and DOSAC seem to be a collection of briefs which have (at best) tenuous links. In the TV show, one of the characters jokes that while the Minister is on holiday staffers were helpless to prevent a garbage truck being driven down Whitehall, while Ministers chucked in policy areas they couldn’t be bothered to deal with. This was how DOSAC came to be as a department, and some might assume it was a similar situation at DCMS. Whoever thought that Digital, Culture, Media and Sport belonged in the same department must surely have been joking. But seeing as most public sector organisations are void of a sense of humour the memo was taken seriously. It might be farcical, but this could be a serious problem. This is supposed to be the department which readies the country for the cut-throat digital era, making sure our infrastructure is ready to compete with the world on the connected stage. 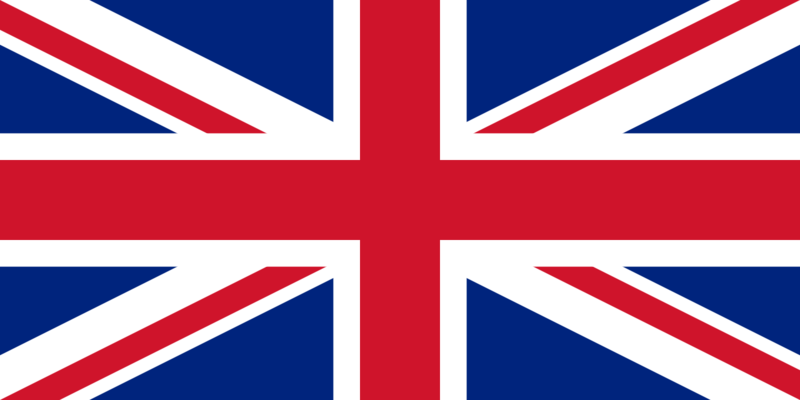 The internet and mobility will define commerce over the coming decades, so some would argue ensuring the UK has a suitable foundation for British businesses to compete would be a critical task. Yet the digital proposals will be put in the same pile as applications to hold the next Badminton World Championships. Considering the importance of digital initiatives and infrastructure, why aren’t these policies more closely aligned with the Department for Business, Innovation & Skills say, or the Department for Business, Energy and Industrial Strategy? These would perhaps make more sense. We suspect that as no-one in government seems to be suitably qualified to lead a technology orientated area, no-one really wants to take responsibility. MPs might sell their grandmothers for a good publicity shot, but perhaps the risk of being known as the person who messes up the digital potential of the UK outweighs the PR benefits of being the face of British digital ambitions? Talking of MPs, our new Secretary of State for Digital, Culture, Media and Sport Matt Hancock is starting to do an excellent impersonation of The Minister for Fun. 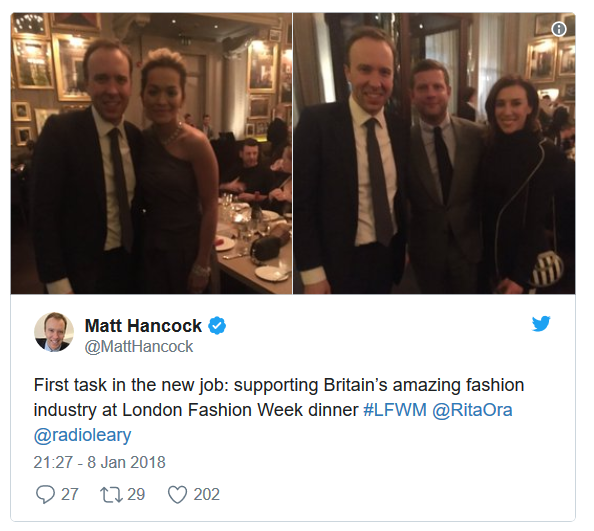 On his first day on the job, Hancock managed to find his way onto the guest list at a London Fashion Week after party, cosying up to stars such as Rita Ora. And this work-hard-play-hard attitude seems to be filtering down to his minions. 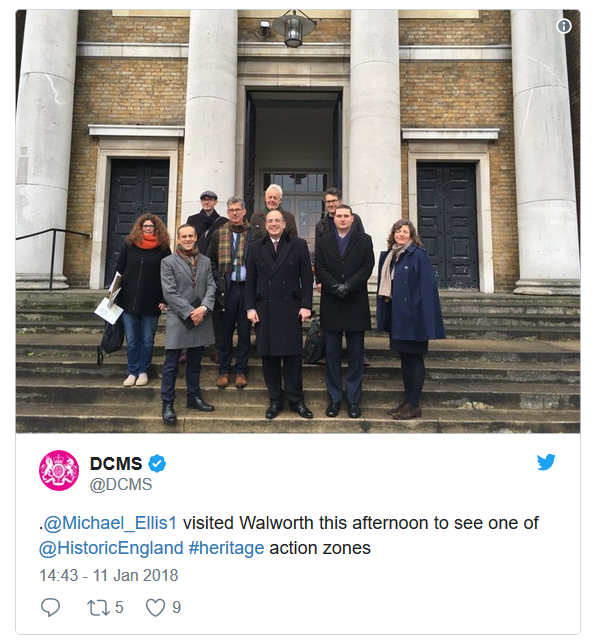 Yesterday (11 January) we spotted one of the new Ministers in the department, MP Michael Ellis, visiting the Tate Modern, and today he’s been out seeing a heritage museum in Walworth. The department still hasn’t managed to figure out who is doing what yet, but who needs the MPs in the office to actually do that. We also assumed that while Minister for Fun Hancock and Minister for Tea and Biscuits Ellis were parading around the capital, the other new appointment, Margot James, would be the buzzkill doing the work. We hoped there might at least be one person in the department who was at their desk doing work. Alas, we were wrong, as you can see on the right. We fully understand that politicians will be out in the field meeting people and helping raise awareness for good causes, but surely this can wait a couple of days. We would like to see these people who are supposedly responsible for our digital capabilities sit down for a couple of hours, hand out the responsibilities and have a bit of a read up about the policies which are in place. But this all seems too much when there is a camera on the horizon. Who knows what this means for the UK digital ambitions, as while the world moves towards agility, flexibility and power, we seem to be stuck. Quips and witty remarks can only get you so far, as we will need to see some action before too long. Ofcom CEO Sharon White conceded during a stakeholders meeting this week that the UK lags behind the digital powerhouses of the world, but correcting this will be a challenge is our Minister for Fun is coming into the office every day nursing a hangover after a night of chumming up with celebs. The UK is losing ground in the digital race, and considering the current set-up, we’re not entirely convinced there is a way back to the front of the pack.